Stat-Ease is proud to offer free webinars to those interested in Design of Experiments (DOE). Presented on a regular basis, topics range from beginner to advanced levels. Material may be new or drawn from our ever-popular DOE workshops. See the list of upcoming and past webinars below. If you attended one of our presentations (or just wish you had) we invite you to download a copy of it for your review. If there is a particular subject you are interested in and don't see below, send us an e-mail and let us know. If there is enough interest, we may present your topic in a future webinar. Thank you for visiting Stat-Ease. We appreciate your interest! Stat-Ease webinars vary somewhat in length depending on the presenter and the particular session—mainly due to breaks for questions: Plan for 45 minutes to 1.5 hours, with 1 hour being the target median. When developing these one-hour educational sessions, our presenters often draw valuable material from Stat-Ease DOE workshops. Attendance may be limited for these webinar sessions. To sign up for the current webinar, look for the date and time you would like to attend and click on the corresponding link. Contact our Client Specialist, Rachel Pollack, with any questions. Please note: We recommend you test your computer in advance. Click here for details. "Thank you very much for the continuing education opportunities through Stat-Ease's webinar offerings. Brooks did a fine job yesterday presenting RSM Part 2. I've also listened to past webinars presented by other instructors and they also do an excellent job of explaining DOE. Thank you, Stat-Ease!" In this advanced-level webinar, Consultant Pat Whitcomb will reveal how to deal with unusually-shaped DOE spaces where classic designs like central composites come up short. Using Design-Expert, he will demonstrate how to build optimal designs for convex, concave and non-linear factor constraints, thus cutting off areas of the design space where data would otherwise be missing. In this beginner-level ‘demo-nar’ (demonstration webinar) of Design-Expert v11, Mark Anderson will feature factorials—the core tool for DOE, followed by a peek at response surface methods (RSM). Via several inspiring case studies, see how you can quickly converge on the ‘sweet spot’—the most desirable combination of process parameters and product attributes. Was presented by Mark Anderson three times in September. This case-study driven webinar is a must for all who experiment on APIs. Learn how to apply statistically valid, multifactor and multicomponent testing strategies that catalyze your development work. The webinar will cover a wide range of API-appropriate design of experiments (DOE): factorial screening and characterization, response surface methods (RSM) for process optimization, mixture designs for optimal formulation, and combined designs such as mixture-process. Whether you use Design-Expert® software (DX) or not, you will benefit by learning about the basic DOE principles. But if you do use DX and remain on v10 or earlier versions, an added advantage for attending will be to see how v11 makes it all far easier. In this webinar, Shari Kraber welcomes you to version 11 of Design-Expert software (DX11). She presents her favorite new features and provides a heads-up on what's in it for you. Enjoy an enlightening demonstration of DX11's overhauled interface and the fabulous new capabilities that come with it. In this webinar, Mark Anderson introduces tools for multi-component product development and optimization. He briefs formulators on tailored tools that hone in on optimal recipes. The webinar begins with a compelling case on the mismatch of factorial design and response surface methods to mixture DOE. Then, via real-world examples, he lays out more appropriate designs and models for mixtures that ultimately lead to the “sweet spot”—a formulation meeting all product specifications. In this webinar, consultant Pat Whitcomb reveals some new tricks for making the most from your DOE, including an innovative way to expand your search for optimal process conditions when you use response surface methods (RSM). Don’t miss this chance to sharpen up your DOE skills! provide interactive layouts that lead to good decisions on sorting out the vital few effects from the trivial many. See how Stat-Ease makes selection of factor effects easy for its users. After a response surface method (RSM) experiment is performed, one of the critical issues becomes selection of a good empirical model. Recently, automatic model selection tools have become very popular, especially in situations where there are a large number of factors. While these tools are fast and easy to use, some caution must be exercised, particularly if the design space is constrained (e.g. a mixture design) or irregularly shaped. In this webinar, Martin Bezener provides a brief overview to model selection in RSM, and discusses the pros and cons of several automatic model selection techniques and criteria. Examples using the Design-Expert® software, version 10 will be given. Was presented by Frank Westad, PhD, Chief Scientific Officer, Camo Analytics and Pat Whitcomb, Founding Principal of Stat-Ease, Inc. on April 21st, 2016. Learn about how multivariate analysis (MVA) methods in combination with Design of Experiments (DoE) tools can be deployed to pinpoint optimal material properties. This webinar will demonstrate how to build an optimal design from principal components and use the DoE results to find an optimal compound. We will provide real world examples of how The Unscrambler® X can be put into practice in context of R&D, engineering and manufacturing. For researchers or data analysts with large or complex data sets that you need to understand better and get deeper insights from. Scientists working in process analysis, chemometrics, spectroscopy, metabolomics or sensometrics, will also find valuable insights on how to enhance their work. The slides for this webinar are available by clicking on the downloadable file below. In this webinar, Pat Whitcomb, Founder of Stat-Ease, Inc., welcomes you to version 10 of Design-Expert software (DX10) for design of experiments (DOE). He hits on the highlights of what’s new and what’s in it for you. For a preview of what’s in store, look here. As a practical matter, the most valuable addition may well be the extension of split-plot design and analysis to response surface and combined designs. Pat provides an enlightening demonstration of this and many other cool new features that provide convincing evidence of why version 10 is a significant step forward from version 9. The webinar is available by clicking on the downloadable files below. In this webinar titled “Unleashing Evaluation: Giving Perspective to Power, Precision, and Problems”, Stat-Ease Consultant Wayne Adams looks at the often neglected tools for evaluating the capability of a design. Wayne will show the usefulness of these tools to choose from alternative experiment designs upfront and assess after-the-fact the negative impact caused by unplanned changes. Sign up now to reserve your spot and learn how to ensure that your hard work remains focused on your goal. In this webinar titled “Split-Plot Pros and Cons”, Stat-Ease Consultant Pat Whitcomb illustrates how to take best advantage of factorial designs geared for hard-to-change process settings. While running through a number of case studies with Design-Expert® software, he provides statistical details and practical advice on the pluses and minuses created by the split-plot factor layout. In most industrial experiments a small number of confirmation runs are performed after statistical analysis to check the validity of the model, but this is not always possible. In this webinar, Martin Bezener first reviews some basic topics about model confirmation. He then discusses an alternative approach which allows design and confirmation runs to be performed in a single experiment. Examples using Design-Expert® software, version 9 (DX9) will be given. In this webinar Shari Kraber provides methods for creating experiment designs progressively so that knowledge can be gained steadily via iterative steps. Using Design-Expert® software she also demonstrates how to augment completed designs that fall short of adequately modeling the critical response(s). This might salvage a great deal of experimental work that would otherwise go for naught. The webinar will illustrate all concepts with practical, real-world examples. The information is presented at an intermediate level. The audience is assumed to have some working knowledge of factorial and response surface method (RSM) designs. I Really Would Rather Not Randomize My Experiment!!! Stat-Ease Consultant Wayne Adams discusses the pros and cons of restricting the randomization of an experiment. 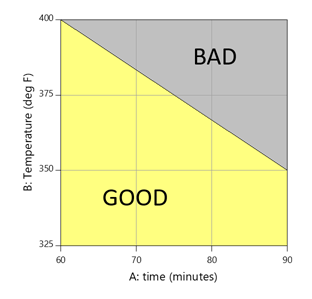 He provides practical advice on how to properly screen and characterize hard-to-change (HTC) factors (for example oven temperature) via factorial split-plot designs—a new feature provided by version 9 of Design-Expert® software (DX9).